A new national survey by the Pew Research Center finds that nearly one-in-five Americans (18%) now say Obama is a Muslim, up from 11% in March 2009. 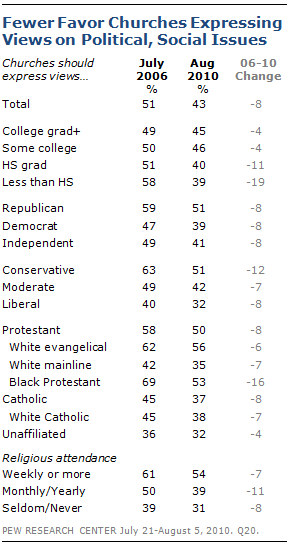 Only about one-third of adults (34%) say Obama is a Christian, down sharply from 48% in 2009. Fully 43% say they do not know what Obama’s religion is. The survey was completed in early August, before Obama’s recent comments about the proposed construction of a mosque near the site of the former World Trade Center. The view that Obama is a Muslim is more widespread among his political opponents than among his backers. Roughly a third of conservative Republicans (34%) say Obama is a Muslim, as do 30% of those who disapprove of Obama’s job performance. But even among many of his supporters and allies, less than half now say Obama is a Christian. 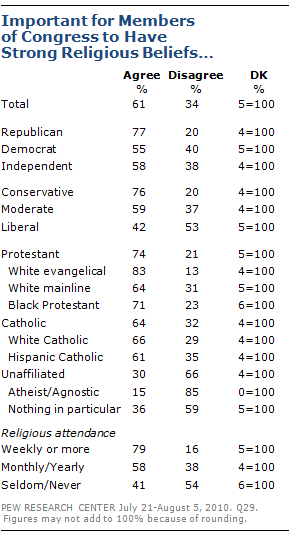 Among Democrats, for instance, 46% say Obama is a Christian, down from 55% in March 2009. When asked how they learned about Obama’s religion in an open-ended question, 60% of those who say Obama is a Muslim cite the media. Among specific media sources, television (at 16%) is mentioned most frequently. About one-in-ten (11%) of those who say Obama is a Muslim say they learned of this through Obama’s own words and behavior. The new poll by the Pew Research Center for the People & the Press and the Pew Forum on Religion & Public Life – conducted July 21-Aug. 5 among 3,003 respondents reached on landlines and cell phones, and interviewed in both English and Spanish – finds that despite increasing uncertainty about Obama’s religion, the public generally says he handles his religious beliefs appropriately. The public sees Obama as less influenced by religion compared with George W. Bush when he was president. Yet relatively small percentages say Obama mentions his faith too infrequently or that he relies too little on his religious beliefs when making policy decisions. Currently, 41% say Obama relies on his religious beliefs “a great deal” (14%) or a “fair amount” (27%) when making policy decisions; in August 2004, 64% said Bush relied on his religious beliefs either a great deal (26%) or a fair amount (38%). Nonetheless, as was the case with Bush, the public generally says that Obama relies on his religious beliefs the right amount when making policy decisions. Roughly half of Americans (48%) think that Obama relies on his beliefs the right amount when making policy, while 21% say he relies too little on his beliefs and 11% too much; in 2004, slightly more (53%) said Bush relied on his beliefs the right amount when making policy. In addition, about as many say Obama (53%) mentions his religious faith and prayer the right amount as said that about Bush (52%) in 2006, though far fewer say Obama mentions his faith too much (10% vs. 24% for Bush). The survey also finds about half of the public (52%) says that churches should keep out of politics, while 43% say churches and other houses of worship should express their views on social and political questions. That is largely unchanged from 2008, but over the previous decade (from 1996 to 2006), narrow majorities had expressed support for churches’ involvement in political matters. The decline since 2006 in the number saying that churches should speak out on social and political issues has been broad-based, including Democrats and Republicans and people from a variety of religious backgrounds. The percentage of black Protestants who say churches should speak out on political matters has dropped sharply, going from 69% in 2006 to 53% today. Despite the growing opposition to political involvement on the part of churches, most people continue to say they want political leaders who are religious. About six-in-ten (61%) agree that it is important that members of Congress have strong religious beliefs. And as in previous surveys, a slight plurality (37%) says that in general there has been too little expression of religious faith and prayer by political leaders. The Republican Party continues to be more widely viewed as friendly toward religion than the Democratic Party. However, both parties are facing declines in the percentages saying they are friendly to religion. 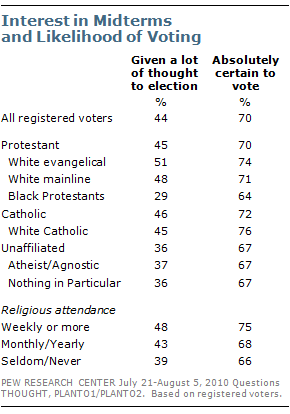 The religious landscape is far more favorable to Republicans than was the case as recently as 2008. Half of white non-Hispanic Catholics (50%) currently identify with or lean toward the Republican Party, up nine points since 2008. Among religiously unaffiliated voters, who have been stalwart supporters of Democrats in recent elections, 29% currently identify with or lean toward the Republican Party, up from 25% in 2008 (the proportion identifying as Democrats has fallen seven points since then). And 33% of Jewish voters identify with or lean toward the Republican Party, up from 20% in 2008. Roughly six-in-ten people (58%) have heard of the “religious right,” while 41% are familiar with the “religious left.” Among those who have heard of the religious right and the religious left, sizable numbers express no opinion as to whether or not they generally agree or disagree with them. NOTE: This report includes comparisons of opinions among different religious groups, which are based on a combination of religious tradition and race/ethnicity. The categories White evangelical Protestants, White mainline Protestants and White Catholics do not include Hispanics. Similarly, Black Protestants do not include Hispanics. Hispanic respondents can be of any race. The survey was conducted in English and Spanish. The share of Americans who believe Barack Obama is a Muslim – which held steady at between 11% and 12% from early 2008 through early 2009 – has jumped to 18%. There also has been a steep decline in the number of people who identify Obama as a Christian – 34% today, down from 48% in March 2009 and 51% in October 2008. 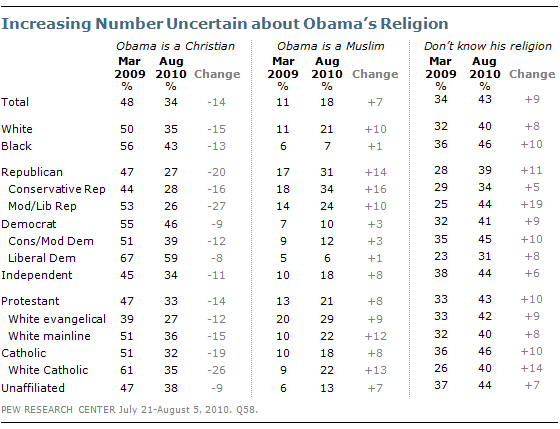 A plurality (43%) now say they do not know what Obama’s religion is, up from 34% in 2009. Download PDF table to see results for more groups. The view that Obama is a Muslim is highest among his political opponents (31% of Republicans and 30% of those who disapprove of his job performance express this view). It is lower among his supporters (10% among both Democrats and those who approve of his job performance). The share of Republicans who say Obama is a Muslim has nearly doubled over the past year and a half – from 17% to 31%. Currently, about as many Republicans believe Obama is a Muslim (31%) as believe he is a Christian (27%); a plurality of Republicans (39%) say they do not know Obama’s religion. 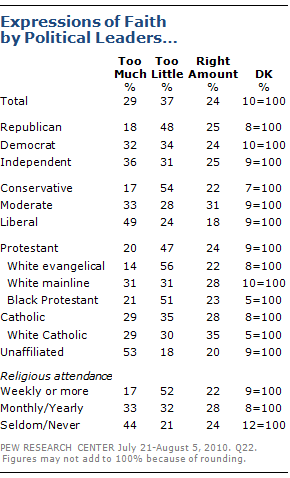 In March 2009, far more Republicans said Obama was a Christian (47%) than a Muslim (17%). The impression that Obama is a Muslim is also more widespread today among independents – 18% say this today, up from 10% in 2009. There has been virtually no change in the share of Democrats who say Obama is a Muslim (10% today, 7% in 2009). But even among Democrats, fewer than half (46%) now identify his religion as Christian, down from 55% last year. There is also a wide racial divide in the perception that Obama is a Muslim. The number of whites who believe this rose from 11% to 21% since March 2009, while there has been virtually no change in blacks’ views on this question (7% say Obama is Muslim today, compared with 6% in 2009). But both blacks and whites are less likely today to say Obama is a Christian. Among religious groups, a higher proportion of white evangelical Protestants say Obama is a Muslim than any other religious group surveyed; 29% hold this view today, up from 20% in 2009. But the share of people saying Obama is a Muslim has increased across all religious groups. Indeed, both white mainline Protestants and white Catholics are roughly twice as likely today as in 2009 to say the president is a Muslim. 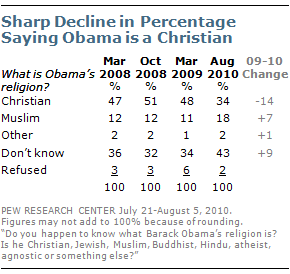 And significantly fewer people in nearly all religious groups say Obama is a Christian than did so in 2009. Obama is perceived as being much less reliant on his faith than was George W. Bush; a plurality (43%) says Obama is not very reliant on his religious beliefs in making policy decisions, compared with just 28% who said that about Bush in 2004. While Obama is seen as less reliant on his religious beliefs than Bush, the public expresses roughly similar levels of satisfaction with Obama’s approach to religion as compared with his predecessor. Nearly half (48%) say Obama relies on his religious beliefs about the right amount when making policy decisions, and 53% say that Obama mentions his faith and prayer about the right amount. Roughly similar numbers said the same thing when asked in 2006 about Bush’s mentions of faith and prayer and in 2004 when asked about Bush’s reliance on religion in making policy decisions. Substantial majorities of Democrats say Obama mentions his faith about the right amount (69%) and that he relies on it the right amount when making policy decisions (67%). This compares with just 34% of Republicans who say he mentions his faith the right amount and 26% who say he relies on his religious beliefs the right amount when making policy decisions. And higher proportions of white evangelical Protestants than other religious groups say Obama mentions his faith and prayer too little and relies on his beliefs too little when making policy. 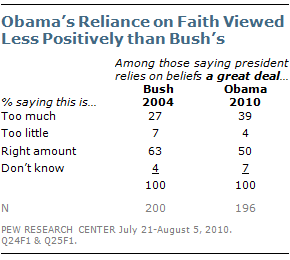 In addition, views of Obama’s approach to religion are linked with perceptions of his own religious beliefs. Only about three-in-ten of those who think Obama is a Muslim say he mentions his faith the right amount (30%) and relies on his beliefs the right amount when making policy decisions (31%). By comparison, large majorities of those who say he is a Christian say he mentions his faith the right amount and relies on his beliefs when making policy decisions the right amount (68%, 66% respectively). The survey also finds some discomfort with the idea that Obama relies a great deal on his faith when making policy decisions, especially compared with Bush in 2004. Among those who say that Obama relies on his religion a great deal when making policy decisions, 50% say he relies on his beliefs the right amount while 39% say that Obama relies on his faith too much. In 2004, by contrast, the balance of opinion was much more positive for Bush; 63% of those who said he relied on his beliefs when making policy said this was appropriate while 27% said he relied on his beliefs too much. on American life, compared with 59% who said this in July 2006. More people now say religion’s influence is on the decline than at any time since 1994, when 69% of respondents in a Gallup poll said religion’s influence on American life was waning. More people also say religion’s influence on government leaders, such as the president and members of Congress, is declining. 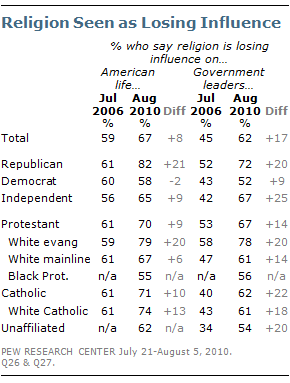 Currently, 62% say that religion is losing its influence on government leaders, compared with 45% who said this in 2006. The number saying that religion is losing influence on American life has increased most among Republicans, with 82% expressing this view, up 21 points since 2006. Similarly, 72% of Republicans now say that religion’s influence on government leaders is declining, up 20 points since 2006. More independents also say that religion is losing its influence on American life (up nine points) and on government leaders (up 25 points). Among Democrats, the number saying that religion is losing influence on government leaders (52%) has increased nine points since 2006, but there has been no significant change in the number of Democrats saying religion’s influence on American society is declining (58% today vs. 60% in 2006). Among religious groups, nearly eight-in-ten white evangelical Protestants see religion’s influence decreasing on both American society (79%, up 20 points since 2006) and on government leaders (78%, up 20 points since 2006). Fewer white mainline Protestants and black Protestants say that religion’s influence is declining. Nearly three-quarters of white Catholics (74%) say that religion has a declining influence on American society, up 13 points since 2006, and 61% say that religion is losing its influence on government leaders, up 18 points since 2006. As in the past, most of those who say that religion has less influence on American life see this as a bad thing; 53% of the total public says this is a bad thing while just 10% see it as a good thing. Similarly, 42% of the public says religion’s declining influence on government leaders is a bad thing while just 15% say it is a positive development. 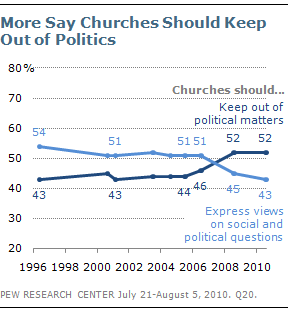 A narrow majority of Americans (52%) now say churches and other houses of worship should keep out of political matters while 43% say that houses of worship should express their views on day-to-day social and political questions. These opinions are little changed since 2008, but in 2006 – and over the preceding decade – narrow majorities had expressed support for churches speaking out on social and political issues. Today’s attitudes are on par with results from 1968, when 53% said churches should keep out of politics and 40% said they should express their views. The decline in support for churches and other houses of worship speaking out on social and political issues has been broad-based. Democrats and Republicans, liberals and conservatives, Catholics and white mainline Protestants are all less supportive of churches and other houses of worship speaking out on political issues. The most dramatic changes in views on this question are seen among black Protestants (53% now say churches should speak out on political matters, compared with 69% in 2006) and people with less than a high school education (39% now say churches should speak out, down from 58% in 2006). While most religious groups are less supportive of churches expressing their views on issues, there continue to be substantial differences on this measure. Majorities of white evangelical Protestants (56%) and black Protestants (53%) say churches should speak out on issues; far fewer white non-Hispanic Catholics (37%) or white mainline Protestants (35%) agree. Republicans continue to be more supportive of churches and other houses of worship expressing their views compared with independents and Democrats. About half of Republicans (51%) favor churches speaking out, compared with 41% of independents and 39% of Democrats. The survey also finds that Americans continue to overwhelmingly oppose churches and houses of worship endorsing specific candidates for public office. Fully 70% say churches should not come out in favor of candidates during political elections while just a quarter (24%) supports such endorsements. These opinions have changed little in recent years. More than half of every major religious group opposes such endorsements. Though the public expresses reservations about churches’ involvement in politics, there is widespread agreement that politicians should be religious. Fully 61% say it is important that members of Congress have strong religious beliefs; just 34% disagree. Majorities across all major religious groups – with the exception of the religiously unaffiliated – agree it is important for members of Congress to have strong religious beliefs. More than eight-in-ten white evangelical Protestants (83%) express this view, as do roughly two-thirds of white non-Hispanic Catholics (66%) and white mainline Protestants (64%). 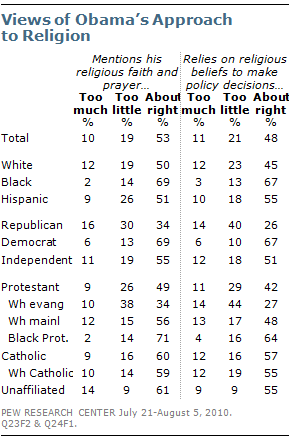 And about seven-in-ten black Protestants (71%) say it is important that lawmakers have strong religious beliefs. In contrast, by more than two-to-one (66% to 30%), the religiously unaffiliated disagree that it is important for members of Congress to have strong religious beliefs. Among atheists and agnostics, fully 85% say it is not important for congressional representatives to have strong religious beliefs. The public continues to be divided about the level of religious expression among political leaders. Nearly four-in-ten (37%) say there has been too little expression of faith by political leaders; 29% say there has been too much, while 24% say political leaders speak on faith and prayer the right amount. These opinions have changed little in recent years. Majorities of white evangelical Protestants (56%) and black Protestants (51%) say there has been too little expression of faith by political leaders. 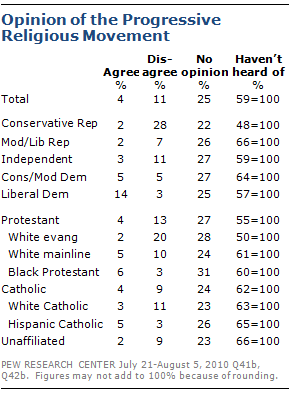 Only about three-in-ten white mainline Protestants (31%) and white Catholics (30%) agree. The religiously unaffiliated continue to say there has been too much – rather than too little – expression of religious faith by political leaders. Fully 53% of the religiously unaffiliated say that politicians speak too much about faith and prayer. Across all religious groups, roughly half (52%) of those who say they attend worship services weekly or more think politicians talk too little about their faith, compared with about one-third (32%) of those who attend services monthly or yearly and just 21% of those who seldom or never attend services. A plurality of the public (43%) sees the Republican Party as generally friendly toward religion, while 28% say it is neutral and 14% say it is unfriendly. By comparison, just 26% say the Democratic Party is friendly toward religion; 41% say it is neutral and 19% say it is unfriendly. The percentages saying each party is friendly to religion have declined over the past two years. In 2008, a narrow majority of the public (52%) said the Republican Party was friendly to religion; that percentage slipped to 48% last year and 43% in the current survey. There has been a comparable decline in the percentage saying the Democratic Party is friendly to religion – from 38% in 2008, to 29% in 2009 and 26% currently. There is no political or religious group in which a majority views the Democratic Party as friendly to religion; even among Democrats themselves, just 42% say the party is friendly to religion, down slightly from last year (47%). Most Republicans (57%) see the GOP as friendly to religion, which is little changed from last year (59%). However, the proportion of white evangelicals saying the Republican Party is friendly to religion has slipped, from 53% last year to 46% today. A majority of Americans (58%) have heard a lot (25%) or a little (33%) about the “religious right,” or the Christian conservative movement. Fewer are familiar with the liberal or progressive religious movement sometimes known as the “religious left,” with 41% saying they have heard either a lot (10%) or a little (30%) about it. About two-thirds of white evangelical Protestants (66%) say they have heard at least a little about the religious right. That compares with 59% of white mainline Protestants, 55% of Catholics and the religiously unaffiliated, and 47% of black Protestants. Among political groups, large majorities of both conservative Republicans (71%) and liberal Democrats (68%) say they have heard at least a little about the religious right, while fewer moderate and liberal Republicans (54%) and conservative and moderate Democrats (50%) have heard something about the movement. Half of white evangelical Protestants (50%) say they have heard at least a little about the religious left. Among other religious groups, significantly smaller proportions (ranging from 34% to 40%) say they know about the movement. 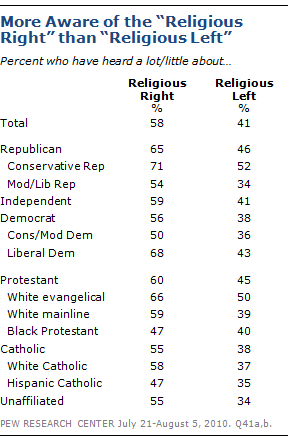 Conservative Republicans are the only political group where as many as half (52%) say they are familiar with the religious left. Just 43% of liberal Democrats say they have heard a lot or a little about the movement. Support for the conservative Christian movement is highest among conservative Republicans and white evangelical Protestants. More than four-in-ten conservative Republicans (41%) and 29% of white evangelicals say they agree with the conservative Christian movement. Just 4% and 6%, respectively, say they disagree with the movement. 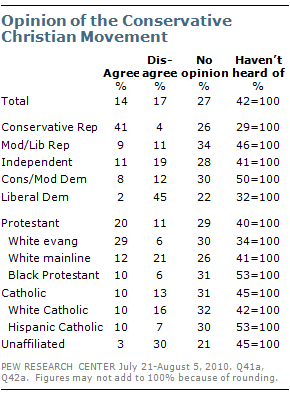 By contrast, 45% of liberal Democrats disagree with the conservative Christian movement while just 2% agree. The religiously unaffiliated disagree with the Christian conservative movement by 30% to 3%. Yet across all religious and political groups – regardless of their view of the movement – large percentages either have not heard of the conservative Christian movement or express no opinion of it. Majorities of conservative Republicans (55%) and white evangelicals (64%) have no opinion of the movement or have not heard of it; this also is the case among liberal Democrats (54%) and the religiously unaffiliated (66%). Even fewer people have formed an opinion of the liberal or progressive religious movement; just 4% agree with this movement while 11% disagree. A quarter of the public (25%) expresses no opinion, while 59% have not heard about the progressive religious movement. Of those who have an opinion on the movement, conservative Republicans (28% disagree) and white evangelicals (20%) express the highest rate of disagreement with the religious left. Liberal Democrats express the highest levels of support for the religious left, with 14% saying they agree with the movement. Voter preferences for the upcoming congressional elections remain closely divided, with 45% currently expressing support for the Democratic candidate in their district and 44% saying they back the Republican candidate. Opinions about the midterm have changed little since the start of the year; in four previous surveys this year, voters also were evenly divided. Among religious groups, white evangelical Protestants overwhelmingly favor the Republican candidate in their district (by 67% to 23%). That is little changed from this point in the previous midterm campaign in 2006. (For a detailed comparison between current voting preferences and the 2006 midterm, see “Republicans Faring Better with Men, Whites, Independents and Seniors,” Aug. 10, 2010). Opinions are more evenly divided among white non-Hispanic Catholics and white mainline Protestants, but the GOP is running better among both groups than it did four years ago. Religiously unaffiliated voters currently favor the Democrats over the Republicans by a 49%-36% margin. Among this group, those who describe themselves as atheists and agnostics are largely loyal to the Democratic Party (64% favor Democrats, 27% favor Republicans). However, those who say their religion is “nothing in particular” are more evenly divided; 39% favor Republicans and 42% favor Democrats, with a large percentage (19%) saying they do not know how they will vote. 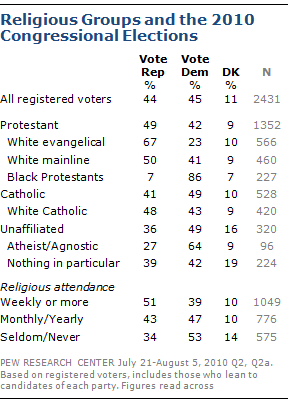 Black Protestants favor the Democrats by a wide margin. Fully 86% of black Protestants say they will vote Democratic, while just 7% say they will support the Republican candidate, which is little changed from this point in the 2006 campaign. Registered voters who say they attend worship services weekly or more favor Republicans by a 12-point margin (51% vs. 39%), while those who say they attend services monthly or yearly are more evenly divided (43% favor Republicans, 47% favor Democrats). Voters who say they attend services seldom or never are 19 points more supportive of Democrats (53%) than Republicans (34%). As the Pew Research Center noted in its Aug. 10 report, the Republican Party continues to hold an engagement advantage over the Democratic Party. More than half of Republicans (55%) say they have given a lot of thought to the election, compared with 37% of Democrats. Among religious groups, about half of white evangelical Protestants (51%) have given a lot of thought to the election, as have 48% of white mainline Protestants and 45% of white Catholics. By contrast, just 36% of the religiously unaffiliated and 29% of black Protestants say they have given a lot of thought to the November election. Despite these differences in how much voters have thought about the election, there is less variation in the proportions who say they are “absolutely certain” to vote in November. Overall, 70% of registered voters say they are absolutely certain to vote in the fall. Among religious groups, 76% of white non-Hispanic Catholics and 74% of white evangelical Protestants say they are certain to vote as do 67% of the religiously unaffiliated and 64% of black Protestants. Three-quarters (75%) of those who say they attend worship services weekly or more say they are certain to vote, compared with two-thirds of those who say they attend monthly or yearly (68%) or attend seldom or never (66%). Analysis of aggregated Pew Research Center surveys from 2006, 2008 and 2010 reveals that Republicans have made gains in the proportion who identify with the GOP or lean to the Republican Party. Overall, 47% of registered voters in 2010 Pew Research Center surveys identify with the Democratic Party or say they lean Democratic, while 43% are Republican or lean Republican. In 2008, 51% identified as Democrats and 39% as Republicans. 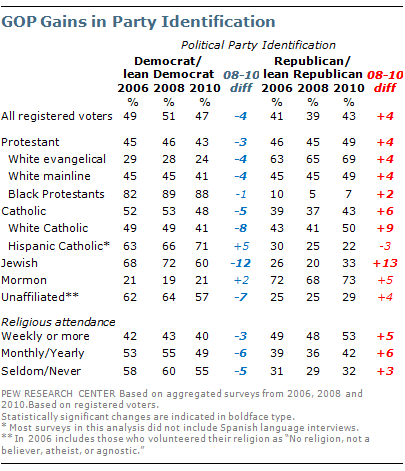 Half of white Catholics (50%) now identify themselves as Republican or lean toward the GOP, up nine points since 2008. 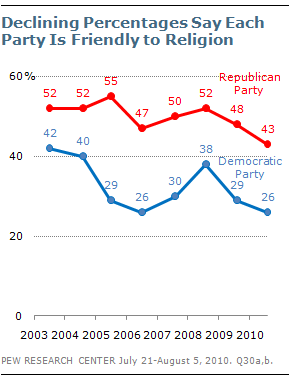 Republicans also have made gains among Jewish voters; 33% now identify or lean Republican, up from 20% in 2008. Results for this survey are based on telephone interviews conducted under the direction of Princeton Survey Research Associates International among a national sample of 3,003 adults living in the continental United States, 18 years of age or older, from July 21-Aug. 5, 2010 (2,002 respondents were interviewed on a landline telephone, and 1,001 were interviewed on a cell phone, including 431 who had no landline telephone). Both the landline and cell phone samples were provided by Survey Sampling International. Interviews were conducted in English and Spanish. For detailed information about our survey methodology, see http://people-press.org/methodology/. The combined landline and cell phone sample are weighted using an iterative technique that matches gender, age, education, race/ethnicity, region and population density to parameters from the March 2009 Census Bureau’s Current Population Survey. The sample is also weighted to match current patterns of telephone status and relative usage of landline and cell phones (for those with both), based on extrapolations from the 2009 National Health Interview Survey. The weighting procedure also accounts for the fact that respondents with both landline and cell phones have a greater probability of being included in the combined sample and adjusts for household size within the landline sample. Sampling errors and statistical tests of significance take into account the effect of weighting. The survey is a joint effort of the Pew Research Center for the People & the Press and the Pew Forum on Religion & Public Life. Both organizations are sponsored by the Pew Charitable Trusts and are projects of the Pew Research Center, a nonpartisan “fact tank” that provides information on the issues, attitudes and trends shaping America and the world. The Pew Research Center for the People & the Press is an independent opinion research group that studies attitudes toward the press, politics and public policy issues. The Center’s purpose is to serve as a forum for ideas on the media and public policy through public opinion research. In this role it serves as an important information resource for political leaders, journalists, scholars and public interest organizations. All of the Center’s current survey results are made available free of charge.